4 Top Recommended Hair Dryers in Japan | Choose the one that suits you best! The function of hair dryer is simple, to literally dry wet hair. Nowadays, there is a wide variety of hair dryers with value-added functions sold on the market. However, most people do not know what benchmark should be considered when choosing their own hair dryer. Since it is used every day, it is important to choose a hair dryer that suits your hair and lifestyle. From international brands Panasonic “NanoCare” series to Dyson, Sharp, Tescom, Koizumi, Nobb, etc., they have recently launched hair dryers providing functions such as air volume, temperature, overseas correspondence, as well as negative ions and, the price is also incredible. We believe that many people will wonder: How should we choose? Therefore, the Discovery Japan editorial department would like to introduce 4 top recommended hair dryers in Japan and the points you want to check when choosing a hair dryer that suits you best. Now, we will introduce 4 popular hair dryers in ranking format for your reference. Panasonic’s “NanoCare” series hair dryer is the most satisfactory in terms of price and function in Japan. Panasonic’s “NanoCare” series hair dryer can release a large amount of nanoe ions in an instant. When nanoe ions are blown onto the hair together with the warm air, it can eliminate static electricity, quickly smooth out the damaged hair cuticle, reduce hair blemishes, and your fingers can pass through the hair smoothly. As a result, the hair will become silky smooth and easy to comb, it’s perfect for people with long hair and lots of hair! Nanoe ions have a moisturizing effect and can penetrate into the stratum corneum of the hair with the small water droplet attached to the surface of the hair after shampooing. It functions to lock in moisture and keep the hair moist and supple, as well as easy to comb. In addition, nanoe ions can eliminate static electricity, quickly smooth hair cuticle, make hair become silky smooth and shiny. It is worth mentioning that this hair dryer has a “Scalp” mode function, which blows the scalp with just warm air instead of overheated wind that may hurt the scalp. In addition, there is a “Smart Temperature Control” function that automatically adjusts the supply air temperature based on the surrounding room temperature. In the upcoming hot summer days, you probably do not have to be sweaty during blowing hair! What has to be highlighted is the newly added “Hair Tip Care” mode function, in which warm air and cold air are automatically blown out alternately to give comfort to the scalp while reducing the dryness of the tip of hair. This mode is set in the “Care” position, so you can easily keep your hair tip moist by simply pressing it. The followings are the reviews from the Japanese. On the whole, this hair dryer has won great praise! The hair is good overall, becomes smooth. There is no static electricity. Even if the hair is repeatedly dyed and permed, the hair can immediately become glossy after using this hair dryer. If you originally have good hair quality, you can use it to make the hair quality even better. The hair becomes obedient, getting up in the morning hair no longer tilted up messily, hair repair solution before sleeping became unnecessary, it makes hair care easier. The air volume is enough to make the hair dry quickly, thanks to nanoe ions, I get a glossy hair with smoothness. I have been used this series of hair dryers earlier, this time I bought the latest models, and after using this hair dryer, it is impossible to use other hair dryers anymore. The “Ionity” series hair dryers, which can be owned with half the budget of the “NanoCare” series, can also provide excellent quick-drying performance. It delivers a wide range of negative ions, ensuring that negative ions can attach to the hair. In addition to the elimination of static electricity, negative ions increase the gloss of the hair by smoothing out the cuticle of the hair. Moreover, shaking the hair dryer while drying hair can let the natural wind, cool wind and warm wind alternately to make the hair shinier. The amount of wind and negative ions made me very satisfied with the price. With a large amount of air, hair started to dry quickly. I am extremely happy with the air volume, minus ion, etc. for price. Even though it is not hot it dries hair quickly and the sound is quiet. Even if the wind hits the face, I do not feel dry. Hair condition after drying is very good. After drying the hair, attach “Scalp Claw Attachment” to the body of the hair dryer, just by sliding the scalp and massaging it can not only loosen the tight and stiff scalp, the high concentration plasma cluster ions are also beneficial to the scalp and can keep the scalp environment comfortable. The plasma cluster ions retain the moisture of the scalp, suppress dandruff and itching, and increase the sense of volume of the hair by making the root plump. It feels good to dry the hair with the scalp claw attachment, and the scalp seems to be better than natural drying. The grip part was hard to use. If you hold it, you will push a button somewhere. Using the attached scalp claw feels good, the hair becomes rich and lustrous, and the usage is simple. I am very happy to buy this hair dryer. 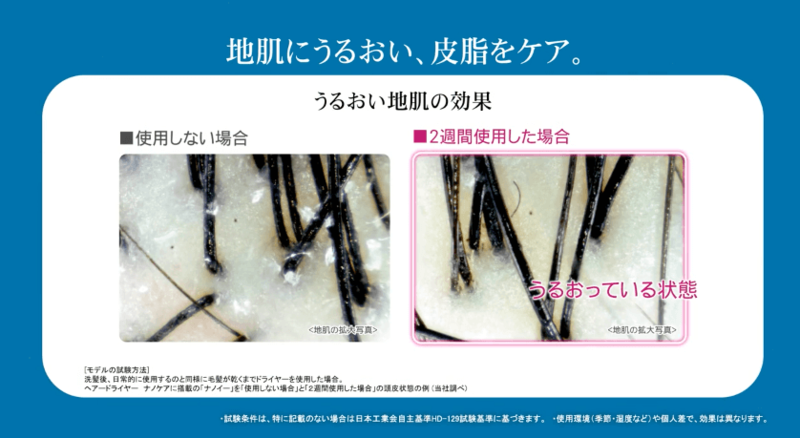 The following figure shows the comparison between the texture of hair with and without using NanoCare for two weeks. The dryness of the scalp causes dandruff, which can be improved by the use of NanoCare hair dryers. It is good for people with dry skin. In addition, nanoe ions are also effective for the tightness of the hair cuticle. The surface of the hair cuticle is scaly; it opens with alkalinity, and closes with weakly acidity. After shampooing, the scales of the hair stratum corneum open, making it difficult to comb the hair. The nanoe ion has a weak acidity, so it can be tightly joined with the hair stratum corneum and smoothen the horny scales of the hair, making the hair smoother. I use it every day while bathing and it feels completely different than the hair dryer I used to use. After drying the hair, the hair will become full and shiny; I cannot live without this hair dryer. I used to think that it was not worth spending money to buy a high-priced hair dryer, but later I couldn’t help buying because of so many good reviews. After using, I found: What is this? How can it be so smooth! I have used a variety of shampoos so far, but they haven’t improved my hair quality at all! It isn’t shampoo. It is a NanoCare hair dryer! Thank you Panasonic! The hair is always smooth and glossy. Especially recommended for dry hair people. It is quick to dry! I feel the hair becomes nourishing by the NanoCare effect. Although the price is worth considering, it will be worthwhile after it is actually used. It is a replacement from the same series. The previous one broke down in 3 and half years, I think the hair dryer’s lifespan is 3 to 4 years, it is reasonable. For a while, I was using a cheap hair dryer which downgraded 2 or 3 ranked from Panasonic, but when I got accustomed to NanoCare, the wind blown by cheap hair dryer really feels cheap. Whether it is the texture of the wind, or the amount of wind, wind power, or even the wind temperature are completely different!